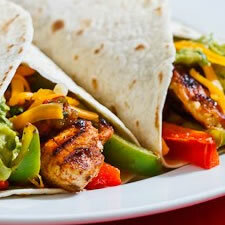 Serve with sauteed green pepper, onion and flour tortillas. Serves 8 or enough marinade for 2 pounds of meat and or poultry. Place marinade in zip lock container and add meat or poultry. Seal and marinate in refrigerator 4 hours or overnight, turning occasionally. Per Serving: 202 Calories; 8g Fat (37.7% calories from fat); 1g Saturated Fat; 29g Protein; 2g Carbohydrate; trace Dietary Fiber; 66mg Cholesterol; 483mg Sodium. Exchanges: 0 Grain(Starch); 4 Lean Meat; 0 Vegetable; 0 Fruit; 1 1/2 Fat; 0 Other Carbohydrates.